Thanks for visiting! If you are already a subscriber, please log in now. Click the back button to return to this page. If you are not a member and would like to become one, please sign up using the "Free Newsletter" form to the right. Note: You will be sent a confirmation email shortly. Please click the link in the confirmation email to get access to this site. Be sure to check your spam folder also. After clicking on the confirmation link in the email sent to you, you may log in here. Log in credentials for new users are your email address, and the default password is "changethis" without quotes. Please change your password to a secure one. Click the back button to return to this page. Here is a fascinating video clip from a demonstration given by Kisaburo Osawa Sensei, 9th dan at, the 1986 All-Japan Aikido Demonstration. 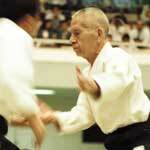 Osawa Sensei was known for his light touch and smooth technical execution, punctuated by sudden bursts of speed. He was 76 years of age at the time of this demonstration. Osawa Sensei had many devoted students at the Hombu Dojo from the 1950s through the early 1980s. He also traveled abroad on a number of occasions to conduct seminars. Today, many younger practitioners are not familiar with Osawa Sensei’s technique or his importance in the postwar development of aikido. Not only was he an outstanding technician, Osawa Sensei wielded tremendous political influence within the Aikikai and, for many years, served as Second Doshu Kisshomaru Ueshiba’s closest advisor. Old-timers have told us over and over again of Osawa Sensei’s significant role within the Aikikai and mastery of diplomacy. We encourage Aikido Journal readers to become familiar with key early figures of the aikido world such as Kisaburo Osawa Sensei for their actions on behalf of the art are responsible for the present-day status of aikido. The video clip from which these stills were taken is featured on the Aikido Journal Members Site. Take a look at this demonstration and watch Osawa Sensei’s deft execution of technique to pick up many fine points about his art. This content is reserved for paid subscribers of the Aikido Journal Members Site. Click here to subscribe and gain access to the thousands of documents available on this website. I have been off the mats for about 1 year due to my dojo closing and a few persistent injuries. However, after watching this video, I am inspired to return to the mats. I am 61 years young and am determined to carry on in Aikido because it is what keeps me young. I hope to earn my black belt someday; but, if that doesn’t happen, I will still be grateful to O Sensei and the art he developed. It has taken me to new levels in my development, both physically and spiritually. Osawa sensei shows harmony to its finest level, showing the true essence of O-sensei’s teachings. Beautiful Aikido! Are the ukes Shoji Seki and Etsuji Horii? A true master of his trade. Wonderful control and precision of movement. I truly appreciate his lack of speed in movement, and instead uses his skill in timing and feel of his uke. balance and union…Beautiful Aikido. Thank you Stan for sharing it!